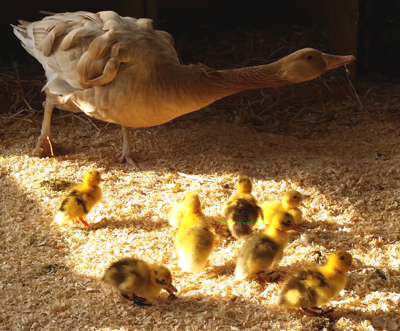 Ancona Duck Eggs Incubated by a Broody Goose! 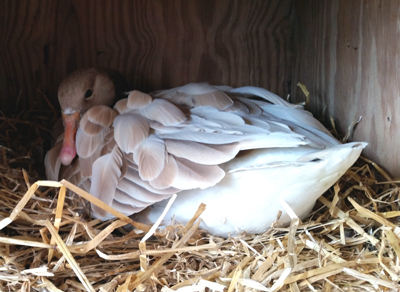 Yes, a goose can incubate duck eggs. Goose with ducklings several days old. 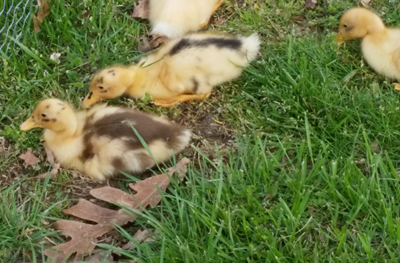 Ducklings 11 days old. "Their patterns are really showing up well. Gotta love Anconas.....no 2 are exactly alike. And check out the little reverse skunk paint job!" 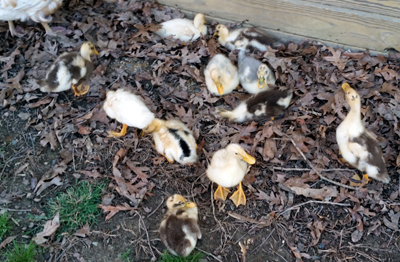 Ducklings 11 days old. 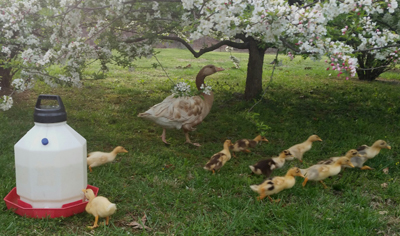 "Their Aunt Bonne has been asking to join them for several days. As you can see, Betsey seems completely comfortable with her near the kids. Hopefully, I'll get them all together Wednesday when I'm off work and can keep an eye on them." 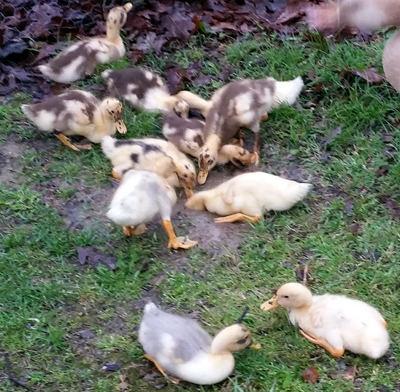 Ducklings at 2 weeks. 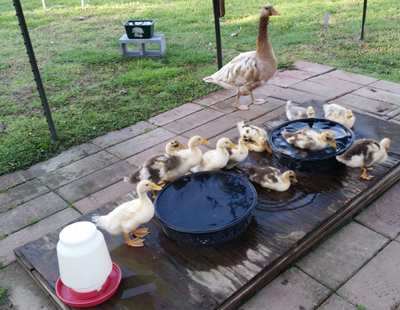 "The second day with their little water pans. Not really swimming, but definitely shallow enough they can safely climb out." 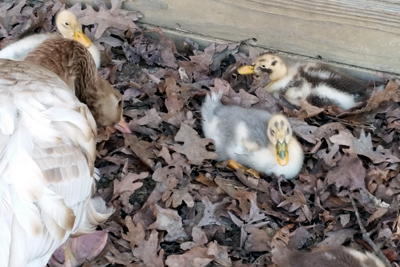 Ducklings at 2 weeks. 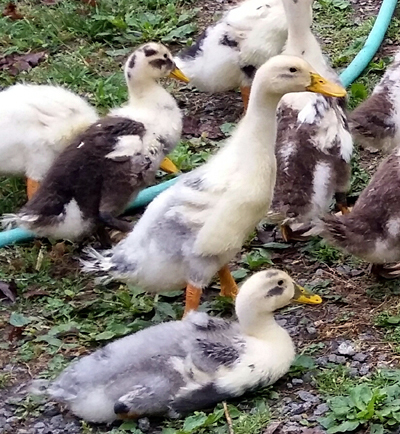 "I added Bonne (Betsey's sister) on Monday night because she had been pacing both the night stall divider as well as the chicken wire temporary nursery yard fence. She appears to have absolutely no parenting desires whatsoever, but she is nonaggressive, and Betsey seems completely comfortable with her sister being so close to her babies. Mud is the order of the day today....BAD ducks! Digging holes in the yard! This is why Dave Holderread's book says not to allow ducks out on turf when it's wet! Check out the one doing an ostrich impression!" 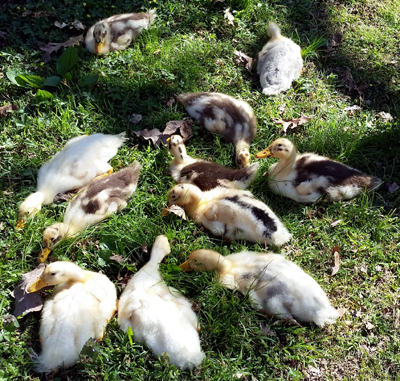 Ducklings at 18 days. 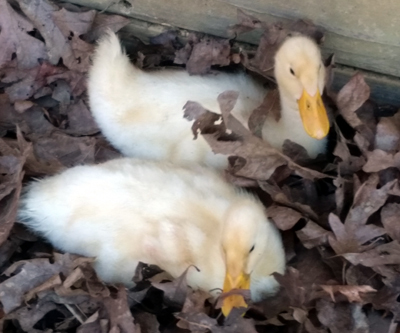 "This appeared to be the day they discovered leaves! They went nuts rummaging around and chattering! 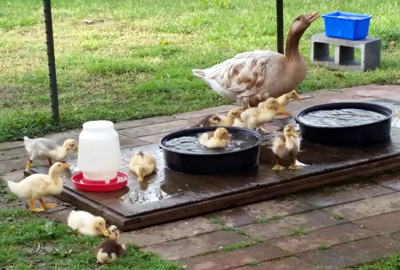 The little females tiny quacks of excitement were just too cute." "I also switched water containers again. They now have 2 shallow pools but of course did not spend much time in them today because MUD is so much more fun. And I swapped the adults' buckets for a shallower pan up on a cinderblock. 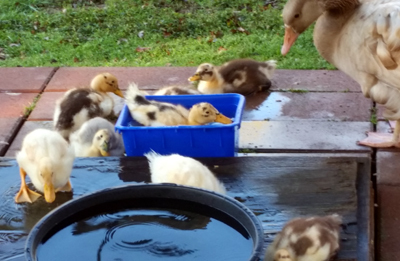 Baby ducks can climb better than most people might think. Years ago, I had one drown that climbed into the adult bucket at about this age so I don't take chances now." 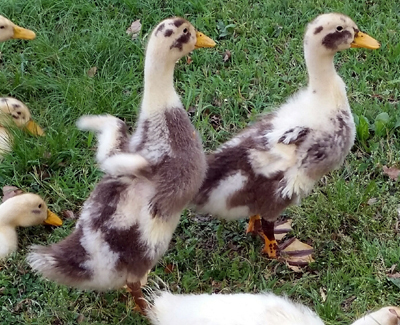 Ducklings at 19 days. "Look at all the colors! I especially like the blue one in the front right here. At this age, I thought I heard it quack, but I was mistaken. It has since proved to be a drake. The other blue drake is a richer, darker color, but I like this one better. As you can already see here, this one has a more broken pattern. And I actually prefer the softer, more pastel blue against the white." 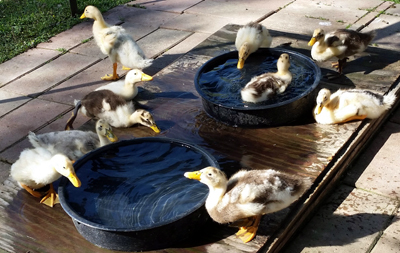 Ducklings at 23 days. "Sooo cute.....tiny wings flapping up!!" 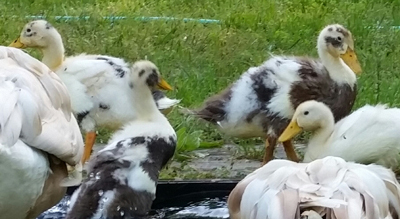 Ducklings at 25 days. "Betsey seems to be suffering from a case of 'heavy-head' disease. 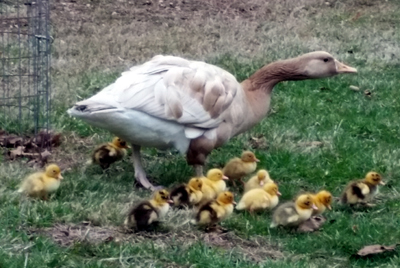 Goose parents are fun to watch until that low hissing head starts coming your direction!" "Right about this age I realized what I thought were 5 chocolates, is actually 4 chocolates and a tricolored!" "Still getting back in the nestbox where they were hatched, every night....but they really don't fit and definitely no room for mom!" 3 Drakes at 5 Months Old. 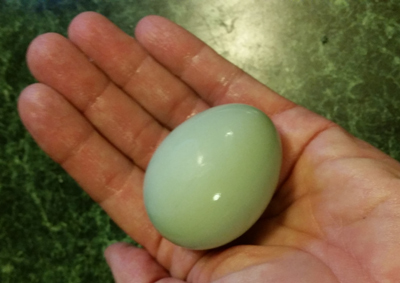 First egg from Chocolate Ancona hen at 5 months old. "Just thought I'd send you a picture of the BetseyBator (Betsey the goose). I swapped her 7 eggs for the 17. The nest box has a plywood top that also serves to block the front. So I eased it off the top and into blocking position, then lifted her out and set her at my feet where she proceeded to chew on my shoe while I swapped eggs. As soon as she saw the board open up, she hopped right back and sat back down. Hopefully, she's as committed as she looks. It's all up to her now......."
"The Betseybator worked!!! She's got twelve little miracles! Not bad for a first timer who was given too many eggs. The fertility rate was outstanding, but I overestimated her nesting size. About 10 days ago, she looked as if she had goo on her bill so I pulled her off the nest to investigate and discovered one egg on top of the rest and several eggs that looked gooey too. The count was now only 15. She must have broken one or two and was trying to clean up. I gently washed the goo from the eggs and quickly got her back on them before the whole batch cooled too much." 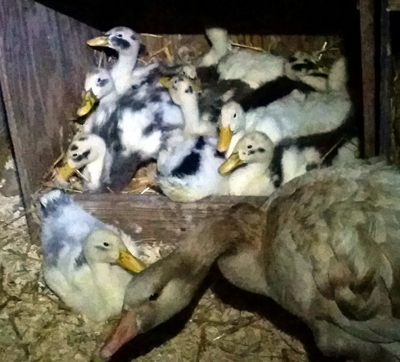 "Yesterday evening when she finally came off her nest, she had 11 lively dry babies. But there was a terrible odor coming from the nest. She argued with me, but I insisted on finding the source. Sadly, 3 appeared to have been crushed, one perhaps a day or two prior. But there was one more who, although completely dry, was still trapped in the shell. It had good air and was sill strong enough to be screaming for mom. So I carefully helped pop it loose. No bleeding from the navel! But all dry and matted. 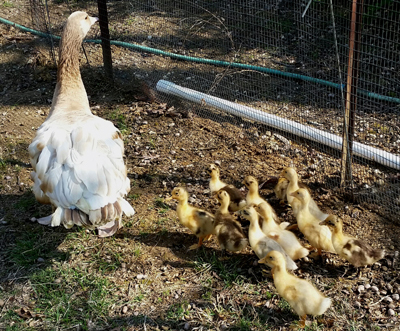 I decided they were probably not yet needing food and water so quickly ushered the rest of the family back in with the straggler so they could help fluff it up and stimulate it." "She is a new mom, and like her mom, is insisting on getting them out of their night stall, rain or shine. So not sure how well she's gonna do keeping them alive. But she is keeping them moving which always seemed to work for her mom. Her sister Bonne has no interest in them whatsoever beyond a brief curiosity about the new yard mates. 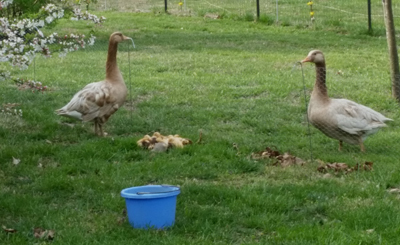 I had hoped she would be a helpful aunt as a couple of Shetland geese I once had were, but that's not going to happen here. But disinterest is waaaay better than agression, so I'm happy. Thanks for a great fertile batch of eggs in a variety of colors!!!!" "They are now a week old which is always a fun time as they seem to double in size every time you look at them! And their color patterns are really beginning to show. Look at those crazy striped feet!! In these pictures you can see how agitated Betsey is from her fanned out tail. 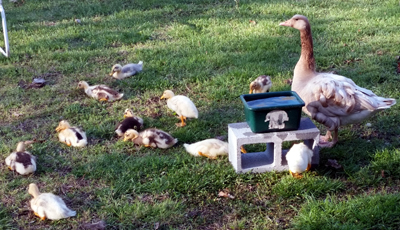 I was in the process of herding them back into their night pen to show them their food is now across the pen from their water (instead of the "new babies" location of right beside it). Anyway, Betsey has been keeping them moving when it's cold and calls them all back into her nest box each night to keep them warm and easy to defend against marauders.....like the crazy lady who brings them food and water!!! She's a great mom. It will be interesting to see how tame her babies will be. So far, they don't seem afraid of me at all but move away from me when Betsey commands to get away from me." "They're really getting big! Their legs are substantial now and with a goose mother to keep them on the move, you'd never know the weather here has been cold in the mornings. She had them out at about 5 days old in 33 degrees at 8 am, and they were busy and happy as could be. 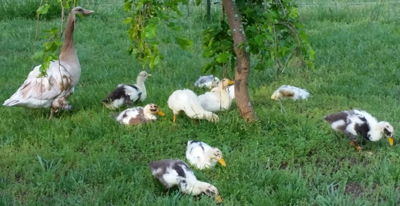 This morning, at 11 days old and 47 degrees, they're busy eating all sorts of stuff out in the yard." "Anconas are a neat breed. Very trusting and bold." 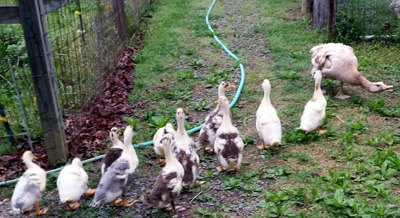 YouTube Video, 10 seconds: Goose with 11-day-old ducklings she hatched. One of my Chocolates started laying on Labor Day! I personally love the green eggs!!!! You can't buy THAT in a grocery store! 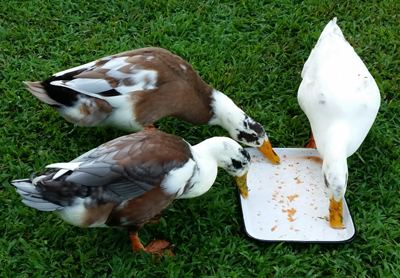 These are the 3 remaining drakes. The tricolored is for sale and should leave tomorrow. I really didn't think much of Rusty at first. To me, he is rather lanky/rangey and a bit too lean and even his bill seems too long. But then he started to molt from juvey feathers into adult and everything about his color changed. He got rusty! While that would be a fault for a blue bird in any other breed, to me eye, it is just beautiful. And if I understand the genetics correctly, that would mean he's only carrying one dose of extended black, which makes him genetically half tricolored! So while I have to sell my phenotypical tricolored to keep the interflock peace, it's ok, because I've got one 'in disguise' in Rusty! And the other drake that's left is Smudge, the lavender in the picture. He's a bit on the huskier, heavier built side so I figure they balance each other out overall. And the ladies love him. I've always thought Smudge was a well built bird.....very close to the line drawing in Holderreads breed bulletin. "Betsey is a true hybrid......her mother was a non-migratory resident Canada goose (which is actually a brant, not a true goose....i.e., a different chromosome count), and her father was a buff saddleback Sebastopol from Holderreads. Therefore, as with equine mules, she is statistically unlikely to be able to reproduce despite being able to lay eggs and having the instinct to nest and rear young. It is interesting to note that she and her siblings were sexable from birth due to the buff color of their father and the gray color of their mother.....males were gray and females were buff. Also, her sister Bonne is, thus far at 6 years old, even more of an oddity as she has not ever laid an egg in her life nor shown any desire to nest or rear young."